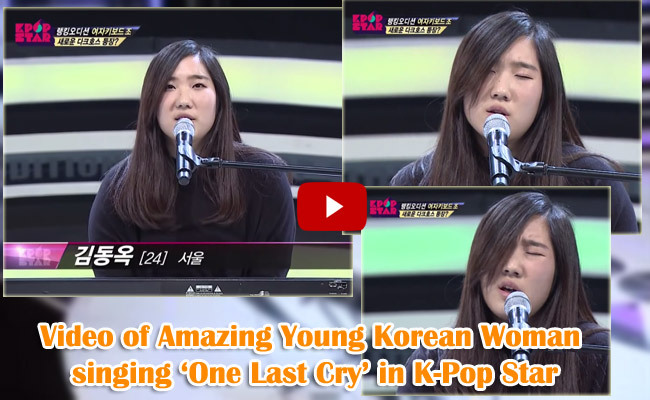 A video of a young Korean woman singing her own rendition of Brian McKnight’s ‘One Last Cry’ had recently gone viral. Her soulful voice had evidently caught the emotions of her fellow contestants in K-Pop Star and the judges. Kim Dong On, also known as Emily Kim as her English name, played with the piano and as soon as she started singing, people had given their ears and interest. Everyone seemed speechless as said by Facebook DJ Reminise who posted the video which now has more than 99,500 likes and almost 130,000 shares. Netizens said that her song was perfect and beautiful and smooth. It was emotional and her voice was wonderful. Her words were clear and could easily give goosebumps to the listeners, the other contenders seemed to be caught up with the song too with their jaws hanging. Survival Edition K-Pop Star is one of the biggest singing competition held in South Korea as they also have auditions in other countries such as in South America, Europe, North America, Australia and other countries in Asia. The winner takes home a contract with the company of his/her choice, two brand new vehicles, entertainment career such as being a cast in a Korean drama and a cash prize of three hundred million won or approx. $300,000.